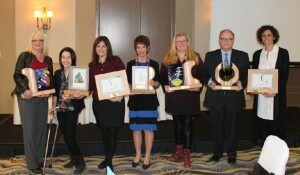 The Learning Disabilities Association of Sudbury (LDAS) hosted their Second Annual Awards Dinner at the Holiday Inn on November 16th, 2017. With more than 120 people in attendance, the fundraising dinner recognized individuals and community partners that have contributed to the successful and continuous growth of the organization. The non-profit organization formed in 1999 when a small group of passionate parents set up an organization that supported children with learning disabilities and their families.